mindseeker Lights Up Vans's Old Skool With "Fire" & "Lightning"
Japanese imprint Mindseeker has rejoined Vans for a duo of graphic-focused Old Skool sneakers. Following last year’s electrified collaboration, the pair have once again unveiled printed sneakers, this time offering flame prints alongside the lightning bolt imagery. 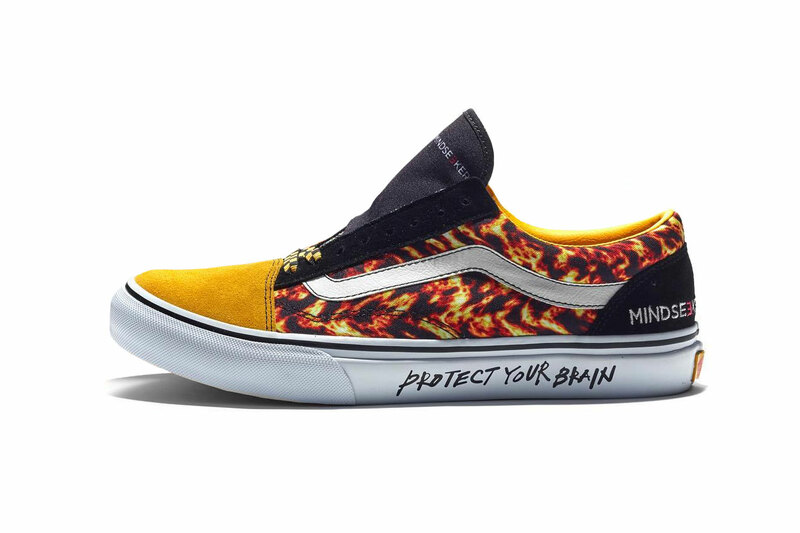 Bolt colors inform each design, including contrasting orange & blue on the lightning shoes and yellow & black on the flame variant, with co-branding and “PROTECT YOUR BRAIN” verbiage emblazoned throughout. The designs even stretch up the tongue, with white laces and a matching jazz stripe to tone things down, or tonal checkerboard laces for a more outré option. The collaborative Old Skool colorways drop on November 3 and 4. Elsewhere, NASA‘s collaborative Vans drop finally received an official release date. Along with a confirmed release date. A glimpse behind the strategy. In orange, green, and blue colorways. Watch Woo and RZA talk about the iconic action film.